S.Janaki, the Melody Queen of South India with her magnificent voice, captured the hearts of millions of people in her reigning days. She was born on 23rd April, 1938, in Pallapatla, Repalle village, Guntur District, Andhra Pradesh. Janaki showed interest in music at a tender age and started singing at the age of three. She started learning music from Sree Paidiswamy and continued her lessons until she was ten years old. Then she moved to Madras on the advice of her uncle Dr. Chandrashekar who nurtured her talents. She received a second prize from the former President Dr. Rajendra Prasad at the competitions held by AIR (All India Radio) in 1956. Mr. Chandrasekhar, her uncle recommended her for a job as a singer in AVM Studio. She joined and started her career with Tamil films in 1957 in the film 'Vidhiyin Vilayattu' under the famous music director T. Chalapati Rao. Later, she got a chance in a Telugu film MLA. From then on, there was no looking back for her. She has several unforgettable hit songs with the association of the maestros of music. Janaki has a unique capability to change her voice and sing in a range of tones. She could sing in a child's voice or an old woman's voice or along with a Shenai quite naturally. She is not only a singer but also a good lyricist and a good music composer. 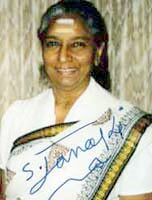 She wrote many songs for Tamil and Telugu films. She has sung about 20,000 songs in her career, in almost all languages in South India as well as in Hindi, Simhalese, Bengali, Oriya, English, Sanskrit, Konkini, Tulu, Saurashtra, Baduga, and German. She has given several unforgettable hit songs on her own and with the association of the maestros of music. She has received many awards for her talent. She won national awards for best singer four times -in 1976 for the song 'Senthoora Poove' in the Tamil Film '16 vayadhinile', in 1980 for the song 'Ettumanoorambalathil' in the Malayalam Film 'Oppol', in 1984 for the song' Vennello godari andham' in the Telugu film 'Sithara', 1992 for the song 'Inji Idippazagha' in the Tamil Film 'Devar magan'. She has won Tamil Nadu state government award 7 times, Kerala state Government awards 14 times, Andhra state government awards 10 times. She was honoured with 'Kalai Mamani' in 1986, 'Sur singar' award in 1987, Cinema 'Achiever Award' by the government of Kerala in the year 2002 and many more. She has almost retired from the industry after husband Sri.V.Rama Prasad's death. A devotee of Lord Krishna and Shirdi Sai Baba, she spends a lot of time praying and has also released devotional music cassettes on Meera. She lives with her son Murali Krishna, an actor and daughter-in-law Uma Murali Krishna, a classical dancer (Bharatnatyam and Kuchipudi) and two grand daughters Amruthavarshini and Apsara. Janaki with her magnificent and versatile voice will remain in the hearts of music lovers for ages to come.